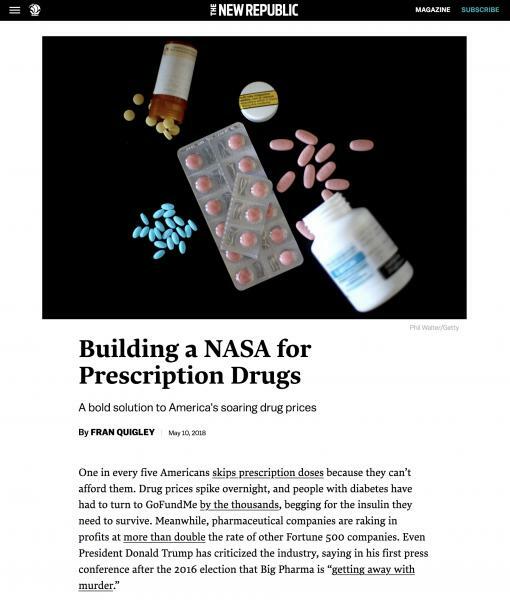 PFAM in The New Republic: "Building a NASA for Prescription Drugs"
PFAM coordinator Fran Quigley published an article in The New Republic, "Building a NASA for Prescription Drugs," about a patent-free, low-cost alternative for robust research and affordable medicine prices. Yet the basic system that keeps drug prices and profits so high remains undisturbed. Trump’s suggestions for reforms—reducing some out-of-pocket costs for seniors and taking small steps toward negotiating drug prices directly with their manufacturers—have, at least thus far, been timid. (On Friday, he’s expected to deliver a speech laying out those proposals in more detail.) More ambitious congressional bills have not moved forward. And while some state legislatures have been making progress, a recent U.S. appellate court decision struck down Maryland’s new statute against prescription price-gouging, adding fuel to the pharmaceutical industry’s argument that only the federal government has the power to regulate drug prices meaningfully.